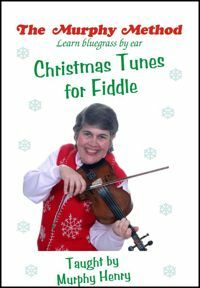 Christmas Tunes for Fiddle: Okay, this definitely seems like a “seasonal” DVD. Something that you’d start thinking about right after Thanksgiving. (“Better learn these before Christmas!”) But it’s actually so much more. With our note-by-note explanation, these holiday favorites are easy to learn and easy to play. As you learn these, we hope that you will get the idea that you, too, can begin to pick out simple melodies that you know by ear. So, this DVD is not just about the songs. It’s about the ear training you are getting, and the joy that comes with realizing you, too, can pick out tunes on the fiddle yourself.No Tab. Silent Night, Jingle Bells, Little Drummer Boy, Good King Wenceslas, Away In A Manger, Joy To the World.